As we saw in the previous chapter, impedance and admittance can be manipulated using the same rules as are used for DC circuits. In this chapter we will demonstrate these rules by calculating total or equivalent impedance for series, parallel and series-parallel AC circuits. Zeq = ZR + ZL = R + j w L = 12 + j*2*p*159*0.01 = (12 + j 9.99) ohm = 15.6 ej39.8° ohm. TINA v6. 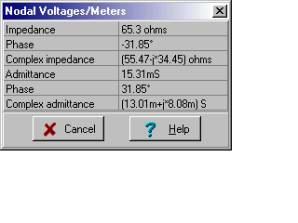 Since TINA’s impedance meter is an active device and we are going to use two of them, we must arrange the circuit so that the meters don’t influence each other. We have created another circuit just for the measurement of the part impedances. In this circuit, the two meters do not “see” each other’s impedance. The Analysis/AC Analysis/Phasor diagram command will draw the three phasors on one diagram. We used the Auto Label command to add the values and the Line command of the Diagram Editor to add the dashed auxiliary lines for the parallelogram rule. As the diagram shows, the total impedance, Zeq, can be considered as a complex resultant vector derived using the parallelogram rule from the complex impedances ZR and ZL . 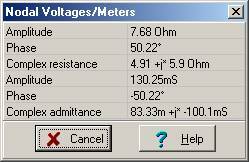 Check your calculations using TINA’s Analysis menu Calculate nodal voltages. When you click on the Impedance meter, TINA presents both the impedance and admittance and gives the results in algebraic and exponential forms. R = 12 ohm and L = 10 mH, at f = 159 Hz frequency. 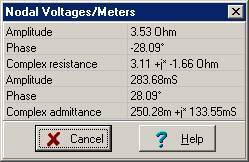 Zeq = 1 / Yeq = 7.68 e j 50° ohm. Find the impedance of a series circuit with R = 10 ohm, C = 4 mF, and L = 0.3 mH, at an angular frequency w = 50 krad/s (f = w / 2p = 7.957 kHz ). Z = (10 + j 10) ohm = 14.14 ej 45° ohms. Starting with the phasor diagram above, let’s use the triangle or geometric construction rule to find the equivalent impedance. We start by moving the tail of ZR to the tip of ZL. Then we move the tail of ZC to the tip of ZR. Now the resultant Zeq will exactly close the polygon starting from the tail of the first ZR phasor and ending at the tip of ZC. Check your calculations using TINA’s Analysis menu Calculate nodal voltages. When you click on the Impedance meter, TINA presents both the impedance and admittance, and gives the results in algebraic and exponential forms. Since the circuit’s impedance has a positive phase like an inductor, we can call it an inductive circuit--at least at this frequency! Find a simpler series network that could replace the series circuit of example 4 (at the given frequency). Don’t forget that, since inductive reactance depends upon frequency, this equivalence is valid only for one frequency. Find the impedance of three components connected in parallel: R = 4 ohm, C = 4 mF, and L = 0.3 mH, at an angular frequency w = 50 krad/s (f = w / 2p = 7.947 kHz). Z = 1/(0.25 + j 0.133) = (0.25 – j 0.133)/0.0802 = 3.11 – j 1.65 =3.5238 e-j 28.1° ohms. The Interpreter calculates phase in radians. If you want phase in degrees, you can convert from radians to degrees by multiplying by 180 and dividing by p. In this last example, you see a simpler way—use the Interpreter’s built in function, radtodeg. There is an inverse function as well, degtorad. Note that this network’s impedance has a negative phase like a capacitor, so we say that—at this frequency—it is a capacitive circuit. In Example 4 we placed three passive components in series, while in this example we placed the same three elements in parallel. Comparing the equivalent impedances calculated at the same frequency, reveals that they are totally different, even their inductive or capacitive character. Find a simple series network that could replace the parallel circuit of example 6 (at the given frequency). We need a strategy before we begin. First we’ll reduce C and R2 to an equivalent impedance, ZRC. Then, seeing that ZRC is in parallel with the series-connected L3 and R3, we’ll compute the equivalent impedance of their parallel connection, Z2. Finally, we calculate Zeq as the sum of Z1 and Z2.